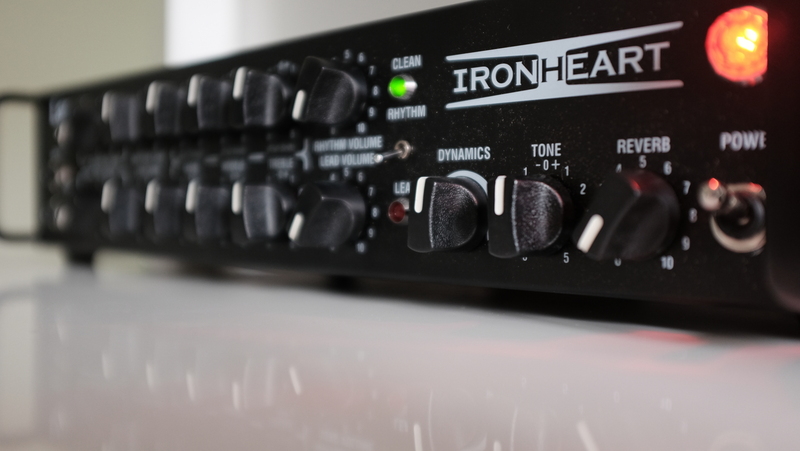 The Laney Ironheart IRT Studio was among the most exciting products I saw at the last NAMM show. It was debuted as a new model in the well established Ironheart series from Laney. This product delivers an excellent valve head in a low power (15watt), studio unit. The Ironheart series combines the technical expertise of the West Midlands with efficient production overseas to create a feature set that is hard to ignore. With a low wattage amp head already in its catalog, the next step for Laney was a studio amp head tightly focused on the home recording market. The IRT-Studio is that studio amp. It compresses the head of a 15-watt all-tube amplifier into an elegant and slender 2 rack-mountable chassis. As expected, the IRT is all steel and metal is cleanly cut and folded, finished in satin black with white labeling. As with most steel boxes, we must remove several screws to access the valves. Take care to replace the screws carefully as misaligned holes will cause damage to the threads. The IRT circuits are divided into three main groups : the front panel and the main circuit board occupies the front third of the tray chassis; both valves and EL84 power transformers are mounted horizontally in a smaller grouping to a steel rail, which adds rigidity to the whole structure plate; while the output components are behind another plate, enclosed in a steel shielded to minimize ringing. Laney products generally use toroidal current transformers, but the IRT uses conventional current transformers and output horseshoe. The printed circuit boards are expertly designed and are of high quality. There is plenty of ventilation, with slots underneath and a grid-shaped anvil on top lit from within by red LEDs. There is no fan on this unit. When it comes to the rackmount, the manual recommends leaving at least one rack space clear above and below the IRT; I would go further and suggest that it should be at the top of any rack, because those EL84s expel a lot of heat, which may not be very good for devices that are immediately above it. The lack of an internal fan is not a big problem; in home studios noise can be a distraction. Using the IRT in a direct environment allows the guitar amp to operate in a completely closed box where the forced cooling rack is not essential. The IRT-Studio has two different output power levels: one for 15 watts and one for less than one watt. There are three channels, with clean and rhythm channels sharing the top EQ, while the lead channel has its own EQ and a separate booster control. The conventional passive EQs utilize pull switches in the bass, midrange and treble to extend the bass response, cut the midrange and expand the treble respectively. I like the red necks on the controls which allow the user to easily see when each switch is activated. To the right of the front panel there are three general controls for dynamic, global tone control (located at the end of the amplification chain), and built in digital reverb. The rear panel of the IRT-Studio includes a fully-balanced XLR output, with mass disconnection, switching level of + 4 / -30dB switchable emulation and speakers. Next is the USB section, which outputs the fully processed sound on the right channel and an unprocessed sound on the left. The USB Channel has its own level control, and there is a reamplification loop connecting the USB return unprocessed to the input amp. There’s an auxiliary input for your MP3 player, a headphone output with its own level control, and a power switch that allows you to monitor whether the signal from the USB or the amp. As if that were not enough, there is a series effects loop with switchable levels, a choice of bypass and, finally, a subwoofer output with switchable impedance and a connector for the IRT foot pedal, which enables remote control channel switching and booster functions both as reverb. The IRT-Studio has all the functionality you could ask for from someone who is serious about home recording. I tested the IRT-Studio in a simple configuration using a home PC with Windows 7 and Cubase, and a more professional environment with a Mac with Pro Tools. I also used it as a simple amp, connected to a 2×12 speaker cabinet equipped with Celestion Vintage 30s. The installation on the computer was easy, needing a little tweaking on the Windows machine to bring the audio to Cubase. I followed the recommendation from Laney to download the ASIO4ALL driver, after which the USB port worked reliably. The XLR output with speaker emulation demonstrated a slightly better quality audio; however, the USB output allows the benefit of re-amplification: the outputting a signal of unprocessed guitar to be returned to the amp after it has been recorded, allowing the audio engineer multiple chances to tweak the sound in order to get it right. The IRT-Studio is primarily targeted at modern metal players. Certainly the sounds the amp puts out are bright and crisp that sound great when enhanced with a touch of the superbly designed digital reverb of the IRT. The bright crisp tones continue through a strong rhythmic percussive crunch and to powerful blistering solos with a practically infinite range. There’s enough room in the IRT-Studio’s tonal range to easily handle seven-stringed instruments with low tunings and long sustain. While the IRT works really well; Laney could have done a bit better with the subtle and slightly saturated sounds one would associate with traditional British tube amps but, to be fair, it was not designed for that kind of tone. The pull switches in the EQ controls for both channels disappointed me. They work, but their effect is not particularly noticeable. I found it was better to use the global dynamics and tone controls when I needed to design a new sound. The Laney IRT Studio has generally proven to be easy to take out of the box and start using in my review. I was able to record a song that sounded commercially viable without any major problems. If your intention is to used this live, there is barely enough power for even small performances without miking. Of course, with the built-in DI, the IRT is designed for connecting to a PA. The IRT-Studio has all the features needed to be an indispensable tool for home use and even for the occasional use in a pro studio. Depending on the situation, I’d even take it along for the live performances. Among the genres in which it is intended, certainly it meets all my expectations. Finding all the features delivered by the IRT Studio in a real tube head is a real feat. At this time, the IRT-Studio does not have much direct competition. Most products are digital modeling solutions delivered as software or hardware – good for the studio, but not for both studio and live use. The advantage of IRT-Studio is that it can easily pass to one another, or even do both at the same time if necessary, making it practically indispensable when the real crunch of tubes and valves is needed. This article has also been published on my personal blog.